The 2019 presidential campaign posters of Governor Ayodele Fayose of Ekiti state, are beginning to flood some parts of Zaria, Kaduna state. 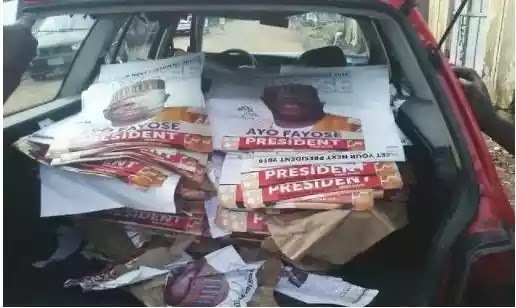 About a month ago Governor Fayose of Ekiti state stormed the Eagle Square, Abuja venue of the national convention of the Peoples Democratic Party (PDP) dressed in his presidential campaign shirt. 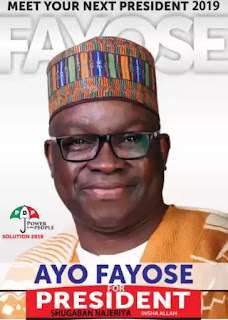 It was earlier reported that Fayose declared his intention to run for the presidency in 2019 saying he will make it official on October 1. The Nation reports that the Ekiti governor made this revelation on Monday, August 7, during the meeting of Peoples Democratic Party (PDP) south-west leaders held in Ibadan, Oyo state. 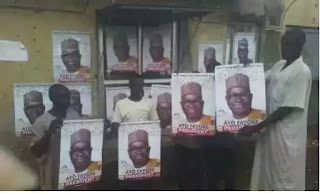 He said: “It is my right to be President of Nigeria as a citizen of this country. I am educated and I have experience in politics. I am vast in public administration. The people want me. I will vie for the presidency under whatever circumstance. I will contest and I will prioritize the interest of the people."